The criteria for invasive species has been controversial, as widely divergent perceptions exist among researchers as well as concerns with the subjectivity of the term “invasive”. Several alternate usages of the term have been proposed. The term as most often used applies to introduced species (also called “non-indigenous” or “non-native”) that adversely affect the habitats and bioregions they invade economically, environmentally, or ecologically. 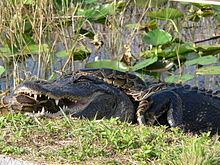 Such invasive species may be either plants or animals and may disrupt by dominating a region, wilderness areas, particular habitats, or wildland–urban interface land from loss of natural controls (such as predators or herbivores). This includes non-native invasive plant species labeled as exotic pest plants and invasive exotics growing in native plant communities. It has been used in this sense by government organizations as well as conservation groups such as the International Union for Conservation of Nature (IUCN) and the California Native Plant Society. The European Union defines “Invasive Alien Species” as those that are, firstly, outside their natural distribution area, and secondly, threaten biological diversity. The term is also used by land managers, botanists, researchers, horticulturalists, conservationists, and the public for noxious weeds. The kudzu vine (Pueraria lobata), Andean pampas grass (Cortaderia jubata), and yellow starthistle (Centaurea solstitialis) are examples. An alternate usage broadens the term to include indigenous or “native” species along with non-native species, that have colonized natural areas (p. 136). Deer are an example, considered to be overpopulating their native zones and adjacent suburban gardens, by some in the Northeastern and Pacific Coast regions of the United States. Sometimes the term is used to describe a non-native or introduced species that has become widespread (p. 136). However, not every introduced species has adverse effects on the environment. A nonadverse example is the common goldfish (Carassius auratus), which is found throughout the United States, but rarely achieves high densities (p. 136). Notable examples of invasive species include European rabbits, grey squirrels, domestic cats, carp and ferrets. The definition of “native” is controversial in that there is no way to precisely determine nativity. For example, the ancestors of Equus ferus (modern horses) evolved in North America and radiated to Eurasia before becoming locally extinct. Upon returning to North America in 1493 during their hominid-assisted migration, it is debatable as to whether they were native or exotic to the continent of their evolutionary ancestors. Ecosystem changes can alter species’ distributions. 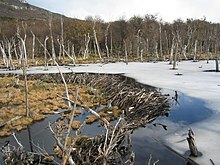 For example, edge effects describe what happens when part of an ecosystem is disturbed as when land is cleared for agriculture. The boundary between remaining undisturbed habitat and the newly cleared land itself forms a distinct habitat, creating new winners and losers and possibly hosting species that would not thrive outside the boundary habitat. This debate hinged on the spatial scale at which invasion studies were performed, and the issue of how diversity affects susceptibility remained unresolved as of 2011. Small-scale studies tended to show a negative relationship between diversity and invasion, while large-scale studies tended to show the reverse. The latter result may be a side-effect of invasives’ ability to capitalize on increased resource availability and weaker species interactions that are more common when larger samples are considered. Invasion was more likely in ecosystems that were similar to the one in which the potential invader evolved. Island ecosystems may be more prone to invasion because their species faced few strong competitors and predators, or because their distance from colonizing species populations makes them more likely to have “open” niches. 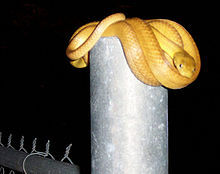 An example of this phenomenon was the decimation of native bird populations on Guam by the invasive brown tree snake. Conversely, invaded ecosystems may lack the natural competitors and predators that check invasives’ growth in their native ecosystems. The arrival of invasive propagules to a new site is a function of the site’s invasibility. Species have also been introduced intentionally. For example, to feel more “at home,” American colonists formed “Acclimation Societies” that repeatedly imported birds that were native to Europe to North America and other distant lands. In 2008, U.S. postal workers in Pennsylvania noticed noises coming from inside a box from Taiwan; the box contained more than two dozen live beetles. Agricultural Research Service entomologists identified them as rhinoceros beetle, hercules beetle, and king stag beetle. Because these species were not native to the U.S., they could have threatened native ecosystems. To prevent exotic species from becoming a problem in the U.S., special handling and permits are required when living materials are shipped from foreign countries. USDA programs such as Smuggling Interdiction and Trade Compliance (SITC) attempt to prevent exotic species outbreaks in America. Fire suppression vehicles are often major culprits in such outbreaks, as the vehicles are often driven on back roads overgrown with invasive plant species. The undercarriage of the vehicle becomes a prime vessel of transport. In response, on large fires, washing stations “decontaminate” vehicles before engaging in suppression activities. Large wildfires attract firefighters from remote places, further increasing the potential for seed transport. Multiple successive introductions of different non-native species can have interactive effects; the introduction of a second non-native species can enable the first invasive species to flourish. Examples of this are the introductions of the amethyst gem clam (Gemma gemma) and the European green crab (Carcinus maenas). The gem clam was introduced into California’s Bodega Harbor from the East Coast of the United States a century ago. It had been found in small quantities in the harbor but had never displaced the native clam species (Nutricola spp.). In the mid-1990s, the introduction of the European green crab, found to prey preferentially on the native clams, resulted in a decline of the native clams and an increase of the introduced clam populations. Some invaders cause negative benefits towards the economy of the local area. For example, in the Great Lakes Region the sea lamprey is an invasive species that acts as a predator. In its original habitat, the sea lamprey used co-evolution to act as a parasite without killing the host organism. However, in the Great Lakes Region, this co-evolutionary link is non existent, so the sea lamprey acts as a predator, and can consume up to 40 pounds of fish in its 12-18 month feeding period. Sea lampreys prey on all types of large fish such as lake trout and salmon. The sea lampreys’ destructive effects towards large fish negatively affects the fishing industry and has helped collapse the population of some economy dependent species. Non-native species can have other benefits. Asian oysters, for example, filter water pollutants better than native[clarification needed] oysters. They also grow faster and withstand disease better than natives. Biologists are currently considering releasing this mollusk in the Chesapeake Bay to help restore oyster stocks and remove pollution. A recent study by the Johns Hopkins School of Public Health found the Asian oyster could significantly benefit the bay’s deteriorating water quality. Additionally, some species have invaded an area so long ago that they have found their own beneficial niche in the environment, a term referred to as naturalisation. For example, L. leucozonium, shown by population genetic analysis to be an invasive species in North America, has become an important pollinator of caneberry as well as cucurbit, apple trees, and blueberry bushes. Invasive species are flora and fauna whose introduction into a habitat disrupts the native eco-system. In response, Invasivorism is a movement that explores the idea of eating invasive species in order to control, reduce, or eliminate their populations. Chefs from around the world have begun seeking out and using invasive species as alternative ingredients. Miya’s of New Haven, Connecticut created the first invasive species menu in the world. Skeptics point out that once a foreign species has entrenched itself in a new place—such as the Indo-Pacific lionfish that has now virtually taken over the waters of the Western Atlantic, Caribbean and Gulf of Mexico—eradication is almost impossible. Critics argue that encouraging consumption might have the unintended effect of spreading harmful species even more widely. Weeds reduce yield in agriculture, though they may provide essential nutrients. Some deep-rooted weeds can “mine” nutrients (see dynamic accumulator) from the subsoil and deposit them on the topsoil, while others provide habitat for beneficial insects or provide foods for pest species. Many weed species are accidental introductions that accompany seeds and imported plant material. Many introduced weeds in pastures compete with native forage plants, threaten young cattle (e.g., leafy spurge, Euphorbia esula) or are unpalatable because of thorns and spines (e.g., yellow starthistle). Forage loss from invasive weeds on pastures amounts to nearly US$1 billion in the U.S. alone. A decline in pollinator services and loss of fruit production has been caused by honey bees infected by the invasive varroa mite. Introduced rats (Rattus rattus and R. norvegicus) have become serious pests on farms, destroying stored grains. Invasive species can impact outdoor recreation, such as fishing, hunting, hiking, wildlife viewing, and water-based activities. They can damage a wide array of environmental services that are important to recreation, including, but not limited to, water quality and quantity, plant and animal diversity, and species abundance. Eiswerth states, “very little research has been performed to estimate the corresponding economic losses at spatial scales such as regions, states, and watersheds“. Eurasian watermilfoil (Myriophyllum spicatum) in parts of the US, fill lakes with plants complicating fishing and boating. The very loud call of the introduced common coqui depresses real estate values in affected neighborhoods of Hawaii. Native species can be threatened with extinction through the process of genetic pollution. Genetic pollution is unintentional hybridization and introgression, which leads to homogenization or replacement of local genotypes as a result of either a numerical or fitness advantage of the introduced species. Genetic pollution occurs either through introduction or through habitat modification, where previously isolated species are brought into contact with the new genotypes. Invading species have been shown to adapt to their new environments in a remarkably short amount of time. The population size of invading species may remain small for a number of years and then experience an explosion in population, a phenomenon known as “the lag effect”. While the study of invasive species can be done within many subfields of biology, the majority of research on invasive organisms has been within the field of ecology and geography where the issue of biological invasions is especially important. Much of the study of invasive species has been influenced by Charles Elton’s 1958 book The Ecology of Invasion by Animals and Plants which drew upon the limited amount of research done within disparate fields to create a generalized picture of biological invasions. Studies on invasive species remained sparse until the 1990s when research in the field experienced a large amount of growth which continues to this day. This research, which has largely consisted of field observational studies, has disproportionately been concerned with terrestrial plants. The rapid growth of the field has driven a need to standardize the language used to describe invasive species and events. Despite this, little standard terminology exists within the study of invasive species which itself lacks any official designation but is commonly referred to as “Invasion ecology” or more generally “Invasion biology”. This lack of standard terminology is a significant problem, and has largely arisen due to the interdisciplinary nature of the field which borrows terms from numerous disciplines such as agriculture, zoology, and pathology, as well as due to studies on invasive species being commonly performed in isolation of one another. The field of island restoration has developed as a field of conservation biology and ecological restoration, a large part of which deals with the eradication of invasive species. “A neutral terminology to define ‘invasive species'”, Robert I. Colautti et al., Diversity and Distributions, (Diversity Distrib.) (2004) 10, 135–141. ^ Exotic Pest Plant Council. ‘Exotic Pest Plants of Greatest Ecological Concern in California‘ accessed 4/10/2010. ^ (September 21, 2006). National Invasive Species Information Center – What is an Invasive Species?. United States Department of Agriculture: National Agriculture Library. Retrieved on September 1, 2007. ^ USA (1999). “Executive Order 13112 of February 3, 1999: Invasive Species”. Federal Register. 64 (25): 6183–6186. ^ “Communication From The Commission To The Council, The European Parliament, The European Economic And Social Committee And The Committee Of The Regions Towards An EU Strategy On Invasive Species” (PDF). Retrieved 2011-05-17. ^ Tsiamis, Konstantinos; Gervasini, Eugenio; D’Amico, Fabio; Deriu, Ivan; Katsanevakis, Stelios; Crocetta, Fabio; Zenetos, Argyro; Arianoutsou, Margarita; Backeljau, Thierry; Bariche, Michel; Bazos, Ioannis; Bertaccini, Assunta; Brundu, Giuseppe; Carrete, Martina; Çinar, Melih; Curto, Giovanna; Faasse, Marco; Justine, Jean-Lou; Király, Gergely; Langer, Martin; Levitt, Ya’arit; Panov, Vadim; Piraino, Stefano; Rabitsch, Wolfgang; Roques, Alain; Scalera, Riccardo; Shenkar, Noa; Sîrbu, Ioan; Tricarico, Elena; Vannini, Andrea; Vøllestad, Leif Asbjørn; Zikos, Andreas; Cardoso, Ana Cristina (2016). “The EASIN Editorial Board: quality assurance, exchange and sharing of alien species information in Europe” (PDF). Management of Biological Invasions. 7 (4): 321–328. doi:10.3391/mbi.2016.7.4.02. ISSN 1989-8649. ^ Urbanek, Rachael E.; K.R. Allen; K.C. Neilsen (2011). “Urban and Suburban Deer Management by State Wildlife-Conservation Agencies”. Wildlife Society Bulletin. 35 (3): 310–315. doi:10.1002/wsb.37. JSTOR wildsocibull2011.35.3.310. ^ Krishna, Neal; Krishna, Vandana M.; Krishna, Ryan N.; Krishna, Sampath (February 2018). “The Invasiveness of the Genus Sylvilagus in Massachusetts and the Resulting Increase in Human Allergen Sensitization to Rabbits”. Journal of Allergy and Clinical Immunology. 141 (2): AB236. doi:10.1016/j.jaci.2017.12.747. ISSN 0091-6749. ^ “Ancient American Horses | Joseph Leidy | Academy of Natural Sciences”. web.archive.org. 2012-03-05. Retrieved 2019-01-10. ^ a b Kolar, C.S. ; D.M. Lodge (2001). “Progress in invasion biology: predicting invaders”. Trends in Ecology & Evolution. 16 (4): 199–204. doi:10.1016/S0169-5347(01)02101-2. PMID 11245943. ^ Thebaud, C.; A.C. Finzi; L. Affre; M. Debussche; J. Escarre (1996). “Assessing why two introduced Conyza differ in their ability to invade Mediterranean old fields”. Ecology. 77 (3): 791–804. doi:10.2307/2265502. JSTOR 2265502. ^ Reichard, S.H. ; C. W. Hamilton (1997). “Predicting invasions of woody plants introduced into North America”. Conservation Biology. 11 (1): 193–203. doi:10.1046/j.1523-1739.1997.95473.x. ^ Williams, J.D. ; G. K. Meffe (1998). “Non indigenous Species”. Status and Trends of the Nation’s Biological Resources. Reston, Virginia: United States Department of the Interior, Geological Survey. 1. ^ Ewell, J.J.; D.J. O’Dowd; J. Bergelson; C.C. Daehler; C.M. D’Antonio; L.D. Gomez; D.R. Gordon; R.J. Hobbs; A. Holt; K.R. Hopper; C.E. Hughes; M. LaHart; R.R.B. Leakey; W.G. Wong; L.L. Loope; D.H. Lorence; S.M. Louda; A.E. Lugo; P.B. McEvoy; D.M. Richardson; P.M. Vitousek (1999). “Deliberate introductions of species: Research needs – Benefits can be reaped, but risks are high”. BioScience. 49 (8): 619–630. doi:10.2307/1313438. JSTOR 1313438. ^ a b Tilman, D. (2004). “Niche tradeoffs, neutrality, and community structure: A stochastic theory of resource competition, invasion, and community assembly”. Proceedings of the National Academy of Sciences. 101 (30): 10854–10861. Bibcode:2004PNAS..10110854T. doi:10.1073/pnas.0403458101. PMC 503710. PMID 15243158. ^ Verling, E.; G.M. Ruiz; L.D. Smith; B. Galil; A.W. Miller; K.R. Murphy (2005). “Supply-side invasion ecology: characterizing propagule pressure in coastal ecosystems”. Proceedings of the Royal Society B. 272 (1569): 1249–1256. doi:10.1098/rspb.2005.3090. PMC 1564104. PMID 16024389. ^ Stohlgren, T.J.; D. Binkley; Chong, Geneva W.; Kalkhan, Mohammed A.; Schell, Lisa D.; Bull, Kelly A.; Otsuki, Yuka; Newman, Gregory; Bashkin, Michael; Son, Yowhan (1999). “Exotic plant species invade hot spots of native plant diversity”. Ecological Monographs. 69: 25–46. doi:10.1890/0012-9615(1999)069[0025:EPSIHS]2.0.CO;2. ^ Sax, D.F. ; S. D. Gaines; J. H. Brown (2002). “Species Invasions Exceed Extinctions on Islands Worldwide: A Comparative Study of Plants and Birds”. American Naturalist. 160 (6): 766–783. doi:10.1086/343877. PMID 18707464. ^ Huenneke, L.; S. Hamburg; R. Koide; H. Mooney; P. Vitousek (1990). “Effects of soil resources on plant invasion and community structure in California (USA) serpentine grassland”. Ecology. 71 (2): 478–491. doi:10.2307/1940302. JSTOR 1940302. ^ HERRERA, Ileana; FERRER-PARIS, José R.; BENZO, Diana; FLORES, Saúl; GARCÍA, Belkis; NASSAR, Jafet M. (2018). “An Invasive Succulent Plant (Kalanchoe daigremontiana) Influences Soil Carbon and Nitrogen Mineralization in a Neotropical Semiarid Zone”. Pedosphere. 28 (4): 632–643. doi:10.1016/S1002-0160(18)60029-3. ISSN 1002-0160. ^ Herrera, Ileana; Ferrer-Paris, José R.; Hernández-Rosas, José I.; Nassar, Jafet M. (2016). “Impact of two invasive succulents on native-seedling recruitment in Neotropical arid environments”. Journal of Arid Environments. 132: 15–25. Bibcode:2016JArEn.132…15H. doi:10.1016/j.jaridenv.2016.04.007. Retrieved 6 May 2016. ^ Hierro, J.L. ; R.M. Callaway (2003). “Allelopathy and exotic plant invasion”. Plant and Soil. 256 (1): 29–39. doi:10.1023/A:1026208327014. ^ Vivanco, J.M. ; Bais, H.P. ; Stermitz, F.R. ; Thelen, G.C. ; Callaway, R.M. (2004). “Biogeographical variation in community response to root allelochemistry: Novel weapons and exotic invasion”. Ecology Letters. 7 (4): 285–292. doi:10.1111/j.1461-0248.2004.00576.x. ^ a b Brooks, M.L. ; D’Antonio, C.M. ; Richardson, D.M. ; Grace, J.B.; Keeley, J.E. ; DiTomaso, J.M. ; Hobbs, R.J.; Pellant, M.; Pyke, D. (2004). “Effects of invasive alien plants on fire”. BioScience. 54 (7): 677–688. doi:10.1641/0006-3568(2004)054[0677:EOIAPO]2.0.CO;2. ^ Silver Botts, P.; Patterson, B.A. ; Schlosser, D. (1996). “Zebra mussel effects on benthic invertebrates: Physical or biotic?”. Journal of the North American Benthological Society (15): 179–184. ^ Byers, J.E. (2002). “Impact of non-indigenous species on natives enhanced by anthropogenic alteration of selection regimes”. Oikos. 97 (3): 449–458. doi:10.1034/j.1600-0706.2002.970316.x. ^ a b Davis, M.A. ; Grime, J.P.; Thompson, K. (2000). “Fluctuating resources in plant communities: A general theory of invisibility”. Journal of Ecology. 88 (3): 528–534. doi:10.1046/j.1365-2745.2000.00473.x. ^ Alverson, William S.; Waller, Donald M.; Solheim, Stephen L. (1988). “Forests Too Deer: Edge Effects in Northern Wisconsin”. Conservation Biology. 2 (4): 348–358. doi:10.1111/j.1523-1739.1988.tb00199.x. JSTOR 2386294. ^ Xu, Cheng-Yuan; Tang, Shaoqing; Fatemi, Mohammad; Gross, Caroline L.; Julien, Mic H.; Curtis, Caitlin; van Klinken, Rieks D. (2015-09-01). “Population structure and genetic diversity of invasive Phyla canescens: implications for the evolutionary potential”. Ecosphere. 6 (9): art162. doi:10.1890/ES14-00374.1. ISSN 2150-8925. ^ Prentis, Peter (2008). “Adaptive evolution in invasive species”. Trends in Plant Science. 13 (6): 288–294. doi:10.1016/j.tplants.2008.03.004. PMID 18467157. ^ Lee, Carol Eunmi (2002). “Evolutionary genetics of invasive species”. Trends in Ecology & Evolution. 17 (8): 386–391. doi:10.1016/s0169-5347(02)02554-5. ^ Zenni, R.D. (2013). “Adaptive Evolution and Phenotypic Plasticity During Naturalization and Spread of Invasive Species: Implications for Tree Invasion Biology”. Biological Invasions. 16 (3): 635–644. doi:10.1007/s10530-013-0607-8. ^ Stohlgren, T.J.; Binkley, D.; Chong, G.W. ; Kalkhan, M.A. ; Schell, L.D. ; Bull, K.A. ; Otsuki, Y.; Newman, G.; Bashkin, M.; Son, Y. (1999). “Exotic plant species invade hot spots of native plant diversity”. Ecological Monographs. 69: 25–46. doi:10.1890/0012-9615(1999)069[0025:EPSIHS]2.0.CO;2. ^ Byers, J.E. ; E.G. Noonburg (2003). “Scale dependent effects of biotic resistance to biological invasion”. Ecology. 84 (6): 1428–1433. doi:10.1890/02-3131. ^ Levine, J. M. (2000). “Species diversity and biological invasions: Relating local process to community pattern”. Science. 288 (5467): 852–854. Bibcode:2000Sci…288..852L. doi:10.1126/science.288.5467.852. PMID 10797006. ^ a b Williams, J.D. ; G. K. Meffe (1998). “Nonindigenous Species”. Status and Trends of the Nation’s Biological Resources. Reston, Virginia: United States Department of the Interior, Geological Survey. 1. ^ Stachowicz, J.J.; D. Tilman (2005). “Species invasions and the relationships between species diversity, community saturation, and ecosystem functioning”. In D.F. Sax; J.J. Stachowicz; S.D. Gaines. Species Invasions: Insights into Ecology, Evolution, and Biogeography. Sunderland, Massachusetts: Sinauer Associates. ISBN 978-0-87893-811-7. ^ Cassey, P; T.M. Blackburn; R.P. Duncan; S.L. Chown (2005). “Concerning Invasive Species: Reply to Brown and Sax”. Austral Ecology. 30 (4): 475–480. doi:10.1111/j.1442-9993.2005.01505.x. ^ Matisoo-Smith, E.; R.M. Roberts; G.J. Irwin; J.S. Allen; D. Penny; D.M. Lambert (1998). “Patterns of prehistoric human mobility in Polynesia indicated by mtDNA from the Pacific rat”. Proceedings of the National Academy of Sciences of the United States of America. 95 (25): 15145–15150. Bibcode:1998PNAS…9515145M. doi:10.1073/pnas.95.25.15145. PMC 24590. PMID 9844030. ^ Leung, B.; N.E. Mandrak (2007). “The risk of establishment of aquatic invasive species: joining invasibility and propagule pressure”. Proceedings of the Royal Society B. 274 (1625): 2733–2739. doi:10.1098/rspb.2007.0841. PMC 2275890. PMID 17711834. ^ “Our Invaluable Invertebrate Collections”. Ars.usda.gov. Retrieved 2011-05-17. ^ Zavaleta, Erika; Hobbs, Richard; Mooney, Harold (August 2001). “Viewing invasive species removal in a whole-ecosystem context” (PDF). Trends in Ecology & Evolution. 16 (8): 458. doi:10.1016/s0169-5347(01)02194-2. Retrieved 21 October 2017. ^ Molnar, Jennifer L; Gamboa, Rebecca L; Revenga, Carmen; Spalding, Mark D (2008). “Assessing the global threat of invasive species to marine biodiversity”. Frontiers in Ecology and the Environment. 6 (9): 485–492. doi:10.1890/070064. ISSN 1540-9295. ^ Drake, John (2007). “Hull fouling is a risk factor for intercontinental species exchange in aquatic ecosystems”. Aquatic Invasions. 2 (2): 121–131. doi:10.3391/ai.2007.2.2.7. ISSN 1818-5487. ^ “Biofouling moves up the regulatory agenda – GARD”. www.gard.no. Retrieved 2018-09-19. ^ Streftaris, N; Zenetos, Argyro; Papathanassiou, Enangelos (2005). “Globalisation in marine ecosystems: The story of non-indigenous marine species across European seas”. Oceanography and Marine Biology. 43: 419–453. ^ “Noxious cargo”. Retrieved 2018-09-19. ^ Great Lake Commission. “Status of Ballast Water Discharge Regulations in the Great Lakes Region” (PDF). ^ USCG. “Ballast Water Management for Control of Non-Indigenous Species in Waters of the United States” (PDF). ^ a b Trainer, Vera L.; Bates, Stephen S.; Lundholm, Nina; Thessen, Anne E.; Cochlan, William P.; Adams, Nicolaus G.; Trick, Charles G. (2012). “Pseudo-nitzschia physiological ecology, phylogeny, toxicity, monitoring and impacts on ecosystem health”. Harmful Algae. 14: 271–300. doi:10.1016/j.hal.2011.10.025. hdl:1912/5118. ISSN 1568-9883. ^ Occhipinti-Ambrogi, Anna (2007). “Global change and marine communities: Alien species and climate change”. Marine Pollution Bulletin. 55 (7–9): 342–352. doi:10.1016/j.marpolbul.2006.11.014. ISSN 0025-326X. PMID 17239404. ^ Rahel, Frank J.; Olden, Julian D. (2008). “Assessing the effects of climate change on aquatic invasive species”. Conservation Biology. 22 (3): 521–533. doi:10.1111/j.1523-1739.2008.00950.x. ISSN 1523-1739. PMID 18577081. ^ Hua, J.; Hwang, W.H. (2012). “Effects of voyage routing on the survival of microbes in ballast water”. Ocean Engineering. 42: 165–175. doi:10.1016/j.oceaneng.2012.01.013. ISSN 0029-8018. ^ Lenz, Mark; Ahmed, Yasser; Canning-Clode, João; Díaz, Eliecer; Eichhorn, Sandra; Fabritzek, Armin G.; da Gama, Bernardo A. P.; Garcia, Marie; von Juterzenka, Karen (2018-05-24). “Heat challenges can enhance population tolerance to thermal stress in mussels: a potential mechanism by which ship transport can increase species invasiveness”. Biological Invasions. 20 (11): 3107–3122. doi:10.1007/s10530-018-1762-8. ISSN 1387-3547. ^ Grosholz, E.D. (2005). “Recent biological invasion may hasten invasional meltdown by accelerating historical introductions”. Proceedings of the National Academy of Sciences. 102 (4): 1088–1091. Bibcode:2005PNAS..102.1088G. doi:10.1073/pnas.0308547102. PMC 545825. PMID 15657121. ^ Mack, R.; D. Simberloff; W.M. Lonsdale; H. Evans; M. Clout; F.A. Bazzazf (2000). “Biotic invasions: Causes, epidemiology, global consequences, and control”. Ecological Applications. 10 (3): 689–710. doi:10.1890/1051-0761(2000)010[0689:BICEGC]2.0.CO;2. ^ Hawkes, C.V.; I.F. Wren; D.J. Herman; M.K. Firestone (2005). “Plant invasion alters nitrogen cycling by modifying the soil nitrifying community”. Ecology Letters. 8 (9): 976–985. doi:10.1111/j.1461-0248.2005.00802.x. ^ Rhymer, J. M.; Simberloff, D. (1996). “Extinction by hybridization and introgression”. Annual Review of Ecology and Systematics. 27 (1): 83–109. doi:10.1146/annurev.ecolsys.27.1.83. ^ Ayres, D.; et al. (2004). “Spread of exotic cordgrasses and hybrids (Spartina sp.) in the tidal marshes of San Francisco Bay, California”. USA Biological Invasions. 6 (2): 221–231. doi:10.1023/B:BINV.0000022140.07404.b7. ^ Primtel, David (2005). “Update on the environmental and economic costs associated with alien-invasive species in the United States”. Ecological Economics. 52 (3): 273–288. doi:10.1016/j.ecolecon.2004.10.002. ^ Fei, S.; J. Philips; M. Shouse (2015). “Biogeomorphic Impacts of Invasive Species”. Annual Review of Ecology, Evolution, and Systematics. 45: 69–87. doi:10.1146/annurev-ecolsys-120213-091928. ^ a b “Great Lakes Fishery Commission – Sea Lamprey”. www.glfc.org. Retrieved 2017-10-24. ^ Van Meerbeek, Koenraad; Appels, Lise; Dewil, Raf; Calmeyn, Annelies; Lemmens, Pieter; Muys, Bart; Hermy, Martin (1 May 2015). “Biomass of invasive plant species as a potential feedstock for bioenergy production”. Biofuels, Bioprod. Bioref. 9 (3): 273–282. doi:10.1002/bbb.1539. ^ SCHLAEPFER, MARTIN A.; SAX, DOV F.; OLDEN, JULIAN D. (2011-02-22). “The Potential Conservation Value of Non-Native Species”. Conservation Biology. 25 (3): 428–437. doi:10.1111/j.1523-1739.2010.01646.x. ISSN 0888-8892. PMID 21342267. ^ Zayed, Amro; Constantin, Şerban A.; Packer, Laurence (2007-09-12). “Successful Biological Invasion despite a Severe Genetic Load”. PLoS ONE. 2 (9): e868. Bibcode:2007PLoSO…2..868Z. doi:10.1371/journal.pone.0000868. ISSN 1932-6203. PMC 1964518. PMID 17848999. ^ Bun Lai (September 1, 2013). “Invasive Species Menu of a World-Class Chef”. Scientific American. 309 (3): 40–43. Bibcode:2013SciAm.309c..40L. doi:10.1038/scientificamerican0913-40. ^ Emma Bryce (6 February 2015). “Cooking can’t solve the threat of invasive species”. The Guardian. Retrieved 16 October 2017. ^ “Invasive Lionfish, the Kings of the Caribbean, May Have Met Their Match”. Retrieved 22 April 2017. ^ a b c d e f g Pimentel, D.; R., Zuniga; Morrison, D (2005). “Update on the environmental and economic costs associated with alien-invasive species in the United States”. Ecological Economics. 52 (3): 273–288. Bibcode:2005ecec.book…..C. doi:10.1016/j.ecolecon.2004.10.002. ^ Simberloff, D. (2001). “Biological invasions – How are they affecting us, and what can we do about them?”. Western North American Naturalist. 61: 308–315. ^ Holden, Matthew H.; Nyrop, Jan P.; Ellner, Stephen P. (2016-06-01). “The economic benefit of time-varying surveillance effort for invasive species management”. Journal of Applied Ecology. 53 (3): 712–721. doi:10.1111/1365-2664.12617. ISSN 1365-2664. ^ 2013. “Citrus Greening.” Invasive Species Program – Pest Alerts. Clemson University – DPI. http://www.clemson.edu/public/regulatory/plant_industry/invasive_exotic_programs/Pest%20Alerts/citrus_greening.html. Accessed 24 May 2013. ^ Azevedo-Santos, V.M. ; O. Rigolin-Sá; F.M. Pelicice (2011). “Growing, losing or introducing? Cage aquaculture as a vector for the introduction of non-native fish in Furnas Reservoir, Minas Gerais, Brazil”. Neotropical Ichthyology. 9 (4): 915–9. doi:10.1590/S1679-62252011000400024. ISSN 1679-6225. ^ Liebhold, S.; et al. (2013). “A highly aggregated geographical distribution of forest pest invasions in the USA”. Diversity and Distributions. 19 (9): 1208–1216. doi:10.1111/ddi.12112. ^ Oswalt, C.; et al. (2015). “A subcontinental view of forest plant invasions”. NeoBiota. 24: 49–54. doi:10.3897/neobiota.24.8378. Balsam woolly aphid Adelges piceae (Ratzeburg) ForestPests.org (March 3, 2005) Retrieved on September 1, 2007. ^ Rodger, Vikki; Stinson, Kristin; Finzi, Adrian (2008). “Ready or Not, Garlic Mustard Is Moving In: Alliaria petiolata as a Member of Eastern North American Forests”. BioScience. 58 (5): 5. doi:10.1641/b580510. ^ Eiswerth, M.E. ; Darden, Tim D.; Johnson, Wayne S.; Agapoff, Jeanmarie; Harris, Thomas R. (2005). “Input-output modeling, outdoor recreation, and the economic impacts of weeds”. Weed Science (Submitted manuscript). 53: 130–137. doi:10.1614/WS-04-022R. ^ Sin, Hans; Adam Radford (2007). “Coqui frog research and management efforts in Hawaii” (PDF). Managing Vertebrate Invasive Species: Proceedings of an International Symposium (G. W. Witmer, W. C. Pitt, K. A. Fagerstone, Eds). USDA/APHIS/WS, National Wildlife Research Center, Fort Collins, CO. Retrieved 2013-06-26. ^ Lanciotti, R. S.; Roehrig, J. T.; Deubel, V.; Smith, J.; Parker, M.; Steele, K.; Crise, B.; Volpe, K. E.; et al. (1999). “Origin of the West Nile virus responsible for an outbreak of encephalitis in the northeastern United States”. Science. 286 (5448): 2333–2337. doi:10.1126/science.286.5448.2333. PMID 10600742. ^ Hallegraeff, G.M. (1998). “Transport of toxic dinoflagellates via ships’ ballast water: Bioeconomic risk assessment and efficacy of possible ballast water management strategies”. Marine Ecology Progress Series. 168: 297–309. Bibcode:1998MEPS..168..297H. doi:10.3354/meps168297. ^ Millennium Ecosystem Assessment (2005). “Ecosystems and Human Well-being: Biodiversity Synthesis” (PDF). World Resources Institute. ^ a b Odendaal, L. J.; Haupt, T. M.; Griffiths, C. L. (2008). “The alien invasive land snail Theba pisana in the West Coast National Park: Is there cause for concern?““. Koedoe. 50 (1): 93–98. doi:10.4102/koedoe.v50i1.153. ^ Mooney, HA; Cleland, EE (2001). “The evolutionary impact of invasive species”. Proceedings of the National Academy of Sciences of the United States of America. 98 (10): 5446–51. Bibcode:2001PNAS…98.5446M. doi:10.1073/pnas.091093398. PMC 33232. PMID 11344292. ^ “Glossary: definitions from the following publication: Aubry, C., R. Shoal and V. Erickson. 2005. Grass cultivars: their origins, development, and use on national forests and grasslands in the Pacific Northwest. USDA Forest Service. 44 pages, plus appendices. ; Native Seed Network (NSN), Institute for Applied Ecology, 563 SW Jefferson Ave, Corvallis, OR 97333, USA”. Nativeseednetwork.org. Archived from the original on 2006-02-22. Retrieved 2011-05-17. ^ Mooney, H. A.; Cleland, E. E. (2001-05-08). “The evolutionary impact of invasive species”. Proceedings of the National Academy of Sciences. 98 (10): 5446–5451. Bibcode:2001PNAS…98.5446M. doi:10.1073/pnas.091093398. ISSN 0027-8424. PMC 33232. PMID 11344292. ^ Mack, Richard N.; Simberloff, Daniel; Mark Lonsdale, W.; Evans, Harry; Clout, Michael; Bazzaz, Fakhri A. (2000-06-01). “Biotic Invasions: Causes, Epidemiology, Global Consequences, and Control”. Ecological Applications. 10 (3): 689–710. doi:10.1890/1051-0761(2000)010[0689:BICEGC]2.0.CO;2. ISSN 1939-5582. ^ “Anttila CK, King RA, Ferris C, Ayres DR, Strong DR. Reciprocal hybrid formation of Spartina in San Francisco Bay. Mol Ecol 9: 765–770 (PDF Download Available)”. ResearchGate. Retrieved 2017-06-02. ^ Rhymer, Judith M.; Simberloff, Daniel (1996). “Extinction by Hybridization and Introgression”. Annual Review of Ecology and Systematics. 27: 83–109. doi:10.1146/annurev.ecolsys.27.1.83. ^ Genetic Pollution from Farm Forestry using eucalypt species and hybrids; A report for the RIRDC/L&WA/FWPRDC]; Joint Venture Agroforestry Program; by Brad M. Potts, Robert C. Barbour, Andrew B. Hingston; September 2001; RIRDC Publication No 01/114; RIRDC Project No CPF – 3A; (PDF). Australian Government, Rural Industrial Research and Development Corporation. ISBN 978-0-642-58336-9. ISSN 1440-6845. Archived from the original (PDF) on 2 January 2004. Retrieved 22 April 2017. ^ “Factors influencing red wolf–coyote hybridization in eastern North Carolina, USA (PDF Download Available)”. ResearchGate. Retrieved 2017-06-02. ^ 2013. “Pest Alert: Citrus Greening.” Clemson University Invasive Species Program. http://www.clemson.edu/public/regulatory/plant_industry/invasive_exotic_programs/Pest%20Alerts/citrus_greening.html. Accessed 24 May 2013. ^ “Invasive plants can create positive ecological change”. ^ a b c d Lowry, E; Rollinson, EJ; Laybourn, AJ; Scott, TE; Aiello-Lammens, ME; Gray, SM; Mickley, J; Gurevitch, J (2012). “Biological invasions: A field synopsis, systematic review, and database of the literature”. Ecology and Evolution. 3 (1): 182–96. doi:10.1002/ece3.431. PMC 3568853. PMID 23404636. ^ Colautti, Robert I.; Hugh J. MacIsaac (2004). “A neutral terminology to define ‘invasive’ species” (PDF). Diversity and Distributions. 10 (2): 135–141. doi:10.1111/j.1366-9516.2004.00061.x. Retrieved 2007-09-01. ^ Warren, Matt (2018-05-08). “Rat begone: Record eradication effort rids sub-Antarctic island of invasive rodents”. Science. Retrieved 2018-05-09. ^ “The Intrepid Rat-Sniffing Terriers of South Georgia Island”. 2018-05-17. Derickx, Lisa; Pedro M. Antunes (2013). A guide to the identification and control of exotic invasive species in Ontario’s hardwood forests. Invasive Species Research Institute – Algoma University. p. 294. ISBN 978-0-9291-0021-0. Dentinger, Rachel (17 Jan 2012). “Reconsidering Non-Native Species: Ecologists challenge the categories that identify some species as natives and others as invaders”. The Naked Scientists. Retrieved 16 July 2013. Schierenbeck, Kristina A.; Lee, Carol Eunmi; Holt, Robert D. (February 26, 2010). “EDITORIAL: Synthesizing ecology and evolution for the study of invasive species”. Evolutionary Applications. 3 (2): 96. doi:10.1111/j.1752-4571.2010.00123.x. ISSN 1752-4571. OCLC 769072511. PMC 3352476. PMID 25567910.